Welcome to McKinney Firearms Training! I am Dr. Gilbert H. "Sandy" Keathley. I have helped over 1700 people get a Texas Concealed Handguin License (now called the LTC) over several years, but some people are looking for other options. Sometimes it is simply not possible to go to the 4-6 hour class required by Texas (even more in some states), due to family or work obligations. Some people are unable to pay the State fee with a credit card, as required. Some people are not proficient with a handgun, and have difficulty meeting the training requirements, because of cost, transportation, or scheduling. Some people already have licenses from other states, are confidant about legal requirements, and just need a short-cut. * Are you confused on how to start this process? * Do you find gun ranges intimidating? * Can't find the time to take a class? This free video is a basic gun safety course that covers core firearm safety, operation, and fundamentals of shooting. It is designed for anyone who is getting started with handgun ownership. 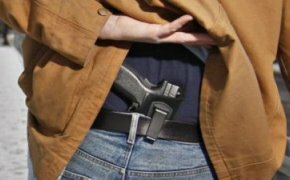 It also qualifies the student to apply for the Virginia non-resident concealed carry permit. Is this license good anywhere? No, only in the green states on the map above. However, any U.S. citizen can apply for the license. Why would I do this instead of getting a license from my own state? Most states require you take an in-person training course in order to qualify for your local state permit. That often involves 4-16 hours in a classroom, plus a shooting test. Virginia is also more lenient in qualification, with some misdemeanor disqualification periods lasting 3 years instead of the 5 years in Texas. Am I guaranteed to get a permit? No, we guarantee that this course meets the training requirements set by the state of Virginia. You still have to submit all the paperwork to them, and pass a background check. The Certificate you will download from our website costs $50.00. The Virginia state fee is $100.00. If you take a private class from a local instructor, you would pay a good bit more than that, and have to block a day to take a class in person. You can take the video training and the test for free. If, at that point, you decide you want the Certificate of Training, you can pay for it online, and download it either right then, or later. You can also pay by check. What is covered in the video course?